You'll Earn 84 Loyalty Points! 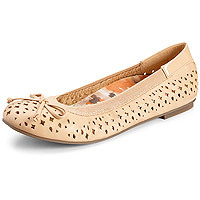 Step lightly in these pretty ballet flats with laser-cut peek-a-boo patterns. A soft band of elasticized fabric keeps them snug and comfy. The customary excellent product by Vionics. Perfect fit -- no break-in time. Good price and prompt service from Sole Provisions. The Vionics system took a little getting used to, but I think I am going to like it a lot! 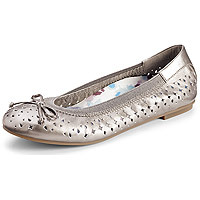 This is my third pair of the Vionic Surin style and they are my favorite flats. 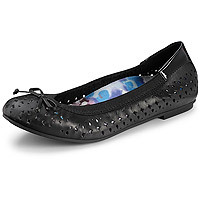 Very comfortable, love the arch support, good for walking. Good price and great service from Sole Provisions. Q: Do these run small? I usually wear a 6 or 6.5. A: The Surin runs true to size. Q: What is the sole material? A: The outsole is made of thermoplastic rubber.